Its a great time to be a Spider-Man fan, and take that from one of them. With Venom releasing in theaters this week (Despite lackluster reviews), Spider-Man: Into the Spider-Verse just around the corner, a new Spider-Man video game that has surpassed expectations, and a chance to see the wallcrawler on the big screen twice next year, most of us couldn't be happier. 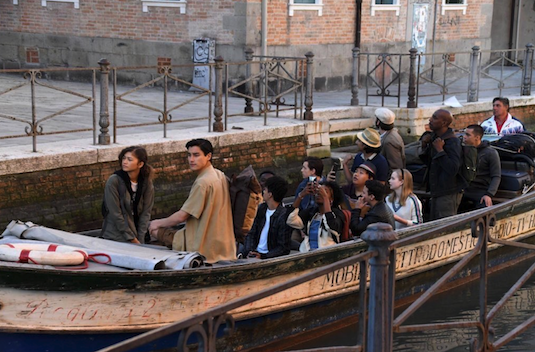 Just when we thought we hadn't gotten as much as we were going to get this week, several new set photos dropped from the European set of Spider-Man: Far From Home; the sequel to 2017's Homecoming. 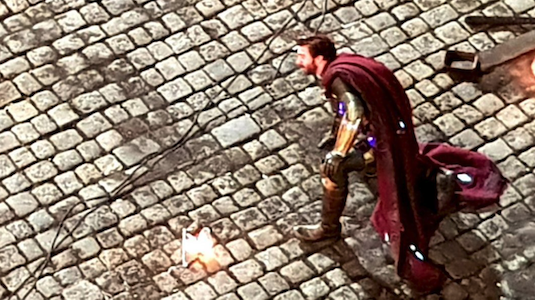 The set photos not only give us our first look a comic accurate Mysterio (Minus the bowl head), but a look at a new all black stealth Spider-Man suit that seems to have been provided by S.H.I.E.L.D. 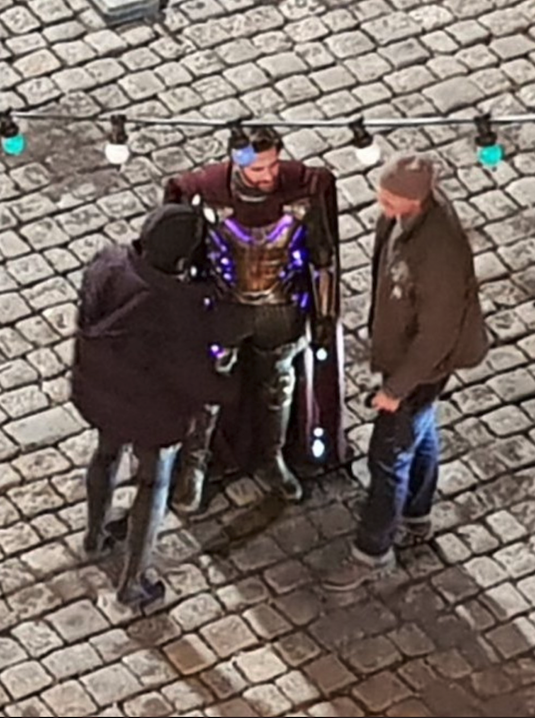 Now the first set photos are of course of Jake Gyllenhaal in full costume as Mysterio. Much the delight of fans, it seems the outfit will be very accurate to the comics. 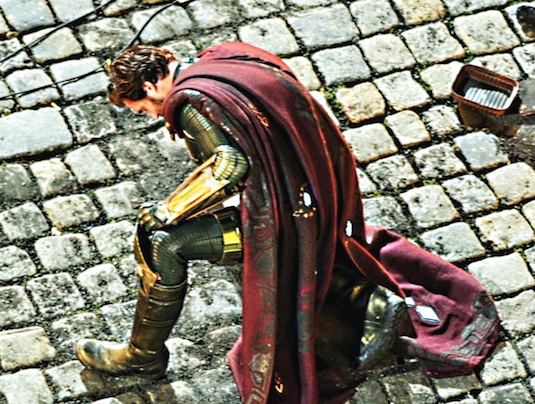 This includes the purple cape, green color scheme to most of us suit, and gold on his arms and feet. Notably absent is of course the famous fish bowl looking head Mysterio wears over his head to protect his identity, which he also fills with mist. He may just not be wearing in this specific scene, but its possible that Jon Watts may have script the bowl due to how ridiculous some feels it would look in live action. 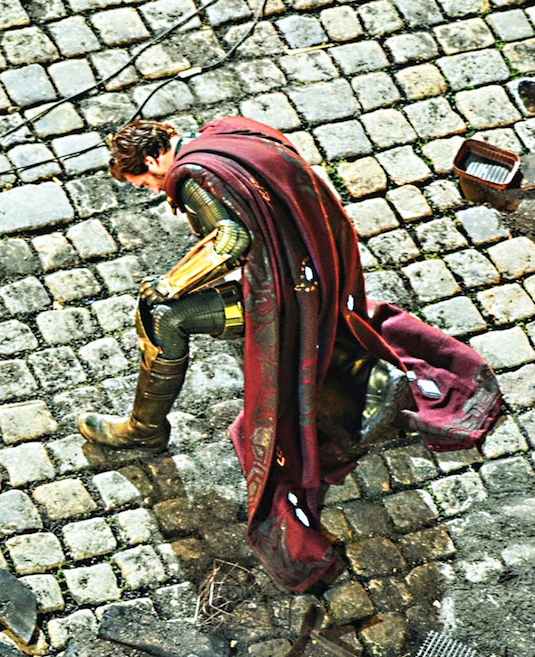 While fans are hoping this isn't the case, this Mysterio may be using a technique more similar to the Ultimate comics where he hides his face behind a white mist without the actual bowl covering it. As for the Spider-Man suit we've seen in the pictures, people were quick to draw comparisons to it and the Spider-Man Noir suit from the comics. 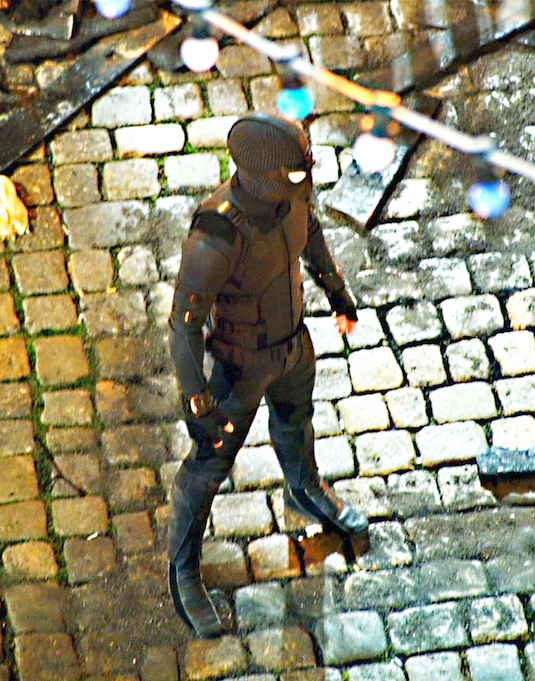 While Spider-Man Noir exists in an alternate universe and likely has no part in this movie, the influences of this suit on the one being used in the movie are clear. The goggles and vested look specifically are very reminiscent of Noir, but in the latest set photos we also see a S.H.I.E.L.D. logo on his upper chest. 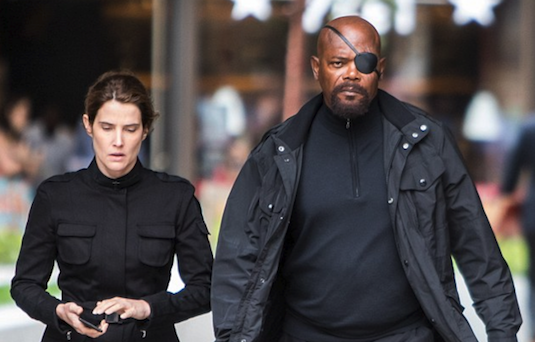 This probably means that at some point Nick Fury and Maria Hill, who are confirmed to appear in the movie, help Peter and provide him with a new suit to take on Mysterio. Although these have been the most notable and revealing of the Far From Home set pics, we have also seen many of Peter and his schoolmates on their class trip in different parts of Europe. Martin Starr, Tony Revolori, and of course Jacob Batalon and Zendaya have all been prevalent in these. There's also been the appearance of another masked character who has been speculated to be the villain Chameleon, but may also just be an illusion created by Mysterio, or some random new character. We've heard rumors of other villains such as Hydro-Man and Molten Man appearing in side roles alongside Mysterio, with speculation suggesting any of these could be the mystery character Remy Hii (Crazy Rich Asians) is playing. So what do you think of these set photos? Are you happy with how they've adapted Mysterio? 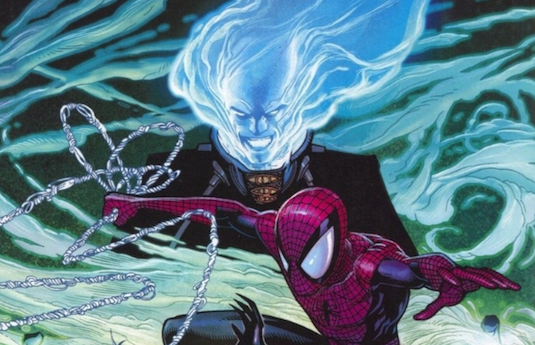 Are you a fan of Spider-Man's new suit? Let us know below!